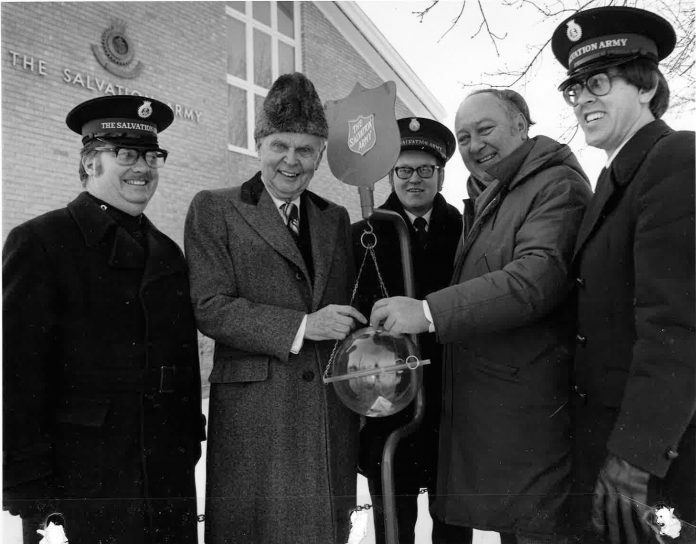 Members of the Prince Albert Salvation Army pose for a photo with city officials and former prime minister John Diefenbaker (second from left) during the 1977 Christmas Kettle Kick-off. -- Photo submitted by Prince Albert Salvation Army. Roughly four decades ago, Claude Pelletier knocked on a door in Regina, searching for help. He was an alcoholic and, in his words, “down on his luck.” The door belonged to the Salvation Army, and the officer who answered it gave an unexpected response. In the 40 years since then, Pelletier has had his ups and downs, but he’s remained committed to his faith, and the organization that helped him find it. When the Salvation Army celebrates their 125th year in Prince Albert on Saturday, he’ll be one of many members honouring the occasion. For the rest of this story, please see the Oct. 25 online or print edition of the Daily Herald.